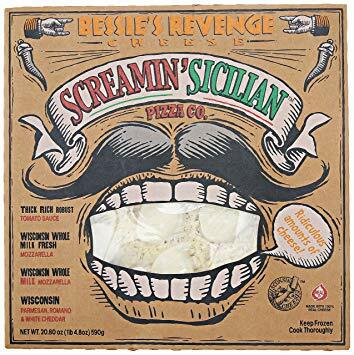 When they call it Bessie's Revenge they really mean attack of the cheese! It has a ridiculous amount of fresh mozzarella, parmesan, romano and white cheddar cheeses with this zesty delicious tomato sauce on a beautiful artisan crust. Combined together makes this beautiful pizza that tastes simply divine. I truly enjoy every bite of this pizza and almost feel guilty by eating it. Small side note*** If you have an air fryer and get the personal pizzas they taste OUT OF THIS WORLD made it in!